The Royal Society for the Prevention of Cruelty to Animals (RSPCA) and the British Veterinary Association (BVA) have jointly called for an end to the exception granted to certain religious groups that allows animals to be killed without pre-stunning. 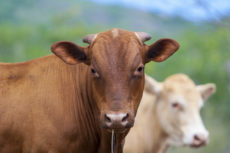 Humanists UK, which campaigns for an end to non-stunned slaughter in the UK due to its inhumane nature and the unnecessary suffering it causes to animals, has welcomed the charities’ push to end ritual slaughter. Blanket bans on non-stun slaughter are in place in Flanders, Denmark, Sweden, Finland, Lithuania, Slovenia, Switzerland, Norway, and Iceland. Humanists UK Director of Public Affairs and Policy Richy Thompson said: ‘Humanists UK is supportive of the recommendations that the RSPCA and BVA have put forward to the UK Government. Evidence by animal rights groups shows that the practice of non-stunned slaughter causes unnecessary suffering to the animal.